– Use phone cam to blog a picture of the Grand Master’s new Masonic Tattoo: Che… wait… what?! 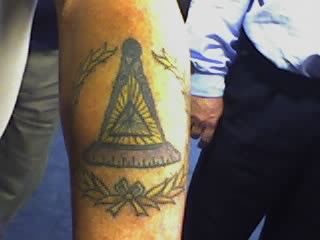 Over a year ago I blogged about Masonic Ink, a website that had pictures of some very cool tattoos. That post continues to get weekly hits as people search for “Masonic Tattoos” and related terms, and when I last checked, the number of pictures had increased almost tenfold since that time. I had been half-convinced to get one of my own, but was held up partly by not knowing what I’d like, and partly by thinking that maybe I was too old for that sort of thing. So, we’re all sitting around after the end of the meeting, having in turn complained about the state of ritual and declaring how it should be fixed, and catching up on what’s happening in the other districts. A few people wave their goodbyes and wander out. I get into a conversation with my counterpart in the western side of the state, when I look up and see the Grand Master showing off his arm. We wander over to see what it is, because you know how these older guys are – maybe it’s a bee sting or a new watch or something, right? I did a double-take. I have to admit that I was impressed; Most Worshipful Bill Greene had one of the nicest- not to mention largest – Masonic tattoos that I’d ever seen in person. We oohed and aahed while he told us that he originally was unsure of what he would put in the center. If he didn’t get to be Grand Master he would have simply put a “G”, but last year when it seemed inevitable, he went all the way. Thinking quickly, I grabbed my phone and asked if he’d mind if I blogged it. Since “shy” and “retiring” are two adjectives that are rarely used with MW Bill, he proudly held out his arm. The little camera on my phone really doesn’t do it justice, but it’s still impressive. Another Lecturer noticed me taking the shot, and asked if I wanted another for the collection. My counterpart in the 4th District – the largest in the state – rolled down his sock to display yet another excellent piece of work. I stopped by Friendship Lodge on the way home, since it was a regular meeting night. I’d missed the meeting, but knew that most of the guys would be hanging out having drinks and relaxing and solving the other problems of the planet. I showed them the pics on my phone, and MW Bill’s popularity – already good – shot up another ten points. Two or three other officers are now thinking about getting their own tattoos, and I suspect that they may well end up dragging me along. Looks like I’d better start shopping for an artist.